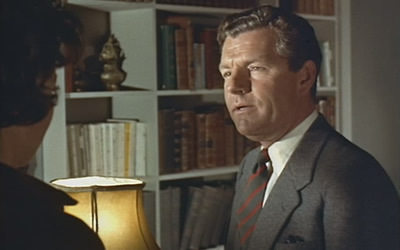 The 1959 film stars Kenneth More as Richard Hannay, the lead role played in the Hitchcock film by Robert Donat. Hannay is out for a pleasant stroll in Regent's Park in London one day when he runs into a nanny pushing a pram, supposedly with a sleeping baby in it. When the nanny (Faith Brook) is involved in a near-miss with a speeding car, Hannay discovers that the pram doesn't contain a baby at all, but a concealed gun. When they return to his apartment, the nanny tells him that she is a British spy working to stop the leaking of information on a ballistic missile programme codenamed "Boomerang". She passes on some key information in case she is killed by enemy spies, telling him that she is going to meet a contact in Glenkirk, a small village in Scotland. She also gives him the vital clue that the head of the enemy spy ring has the top of one of his fingers missing. Anyone who's seen any version of The 39 Steps will guess that the nanny is about to be killed by enemy agents, and Hannay framed for murder. This forces Hannay to flee. He boards the express train to Edinburgh, and goes looking for the spy's contact in Scotland, while also trying to evade both the police and pursuing enemy agents. Along the way he runs into a schoolteacher (Taina Elg) who doesn't believe his stories about spies, a helpful lorry driver (Sid James), and a phoney medium, Nell (Brenda de Banzie), who runs a roadside café with her meek husband (Reginald Beckwith), where Hannay is offered shelter. This version of The 39 Steps is a relatively early entry in the list of Hitchcock remakes. Although officially based on the John Buchan novel of 1915, it's very obviously a straightforward remake of the Hitchcock film, and owes little to the book. The film's screenwriter, Frank Harvey, had written a couple of thrillers earlier in the decade, most notably Seven Days to Noon (1950), but by the late 1950s was mostly working on comedy scripts for the Boulting brothers, including Private's Progress (1956), Brothers in Law (1957) and the BAFTA-winning screenplay for I'm All Right, Jack (1959). Harvey's script adds a couple of new elements and makes a few minor changes, but otherwise follows the plot and structure of the Hitchcock film very closely. Hannay's having to address a political meeting is replaced in this version by his being mistaken for the guest speaker at a girls' school, where he gamely attempts to give a talk on "the woods and the wayside" ("Remember girls, don't fall by the wayside ... and stay out of the woods!"). The sequence at the roadside café replaces the one at the crofter's cottage in the 1935 film. Instead of a naive young wife and her suspicious husband, we get a highly sexed middle aged woman and her apparently willingly cuckolded partner. Other than this scene, which implies that Sid James's lorry driver was meeting Nell's sexual needs while he was staying there, to the relief of her husband, the film is pretty inoffensive. The risqué humour of the two lingerie salesmen who share Hannay's train compartment in the 1935 film has been removed. Instead, Hannay's fellow passengers are a group of giggling schoolgirls gossiping about their teachers. Hannay's encounter with the female spy is also cleaned up, in line with Kenneth More's decent chap image. Their meeting in the park is quite innocent, unlike Donat's meeting with Annabella Smith (Lucie Mannheim) in the 1935 film, when she invites herself back to his apartment after they meet at a music hall. Frank Harvey's facility for comedy is evident in the fact that this version of The 39 Steps is a much lighter affair than the Hitchcock film. It's more of a light comedy with mild thrills than a thriller with comic elements, and a light-hearted tone is maintained throughout. The sprightly theme music, by Clifton Parker, does at least tip us off that we should expect a lightweight entertainment and not a dark and brooding thriller. The film was made by the director-producer team of Ralph Thomas and Betty Box, perhaps best known for the Dirk Bogarde comedy Doctor in the House (1954) and its sequels. That probably gives a fair impression of the film's vices and virtues. As a thriller, it doesn't work at all. Ralph Thomas isn't able to create any suspense and Kenneth More's Hannay is so unflappable that you never believe he's ever in any real danger. The direction is quite pedestrian and Ralph Thomas doesn't have the confidence or élan to overcome implausibilities and plot holes in the way that Hitchcock could. The lack of imagination and literal-mindedness is probably summed up by the opening title sequence showing the credits superimposed over (did you guess?) a shot of some steps. But as a fairly jolly jaunt across 1950s Britain, the film does have a bit of charm, and some of the supporting roles are well cast, particularly James Hayter as Mr Memory. Brenda de Banzie, who has a memorable supporting role as the flirty Nell, had also recently appeared in a significant role in Hitchcock's 1956 remake of his own 1934 film The Man Who Knew Too Much. The enemy agents trailing Hannay are given a bit more screen time but, as portrayed by Duncan Lamont and Michael Goodliffe, they are not very menacing. In fact, nothing much is in this version of The 39 Steps. It's more of a pleasant Sunday afternoon film. There is even some attractive scenery photographed by Ralph Thomas's regular cinematographer Ernest Steward. The film does get out of the studio much more than the Hitchcock one, making fair use of its Scottish locations in particular. Most of these were in Stirlingshire and Perthshire in central Scotland, and included Dunblane and Killin. The crew even filmed on and around the actual Forth Bridge in the scene where Hannay jumps from the train to evade the police. This location filming, shot in colour rather than the black & white of the 1935 film, does help to give the film some appeal as a portrait of Britain at the end of the 1950s. 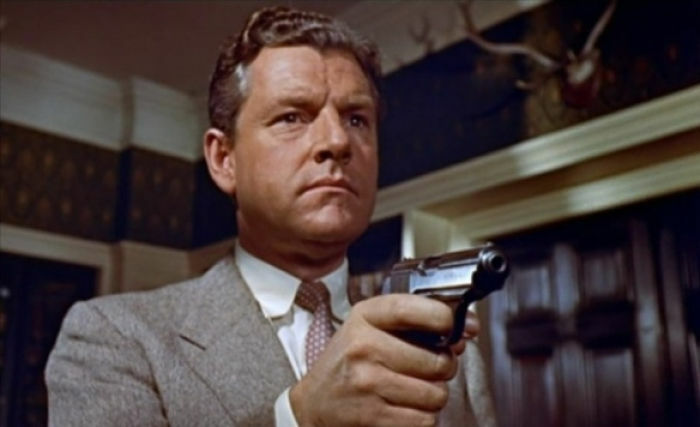 Kenneth More gives a typically breezy performance as Hannay, but he doesn't quite fit the world of spies and chases and murders. He is so unperturbed by events, and his demeanour almost carefree, that's there's not much tension or excitement in the cross-country pursuit. More's Hannay is also clearly not an outsider in England as Donat's was. In the Hitchcock film, Donat is visiting London from Canada when he becomes caught up in the spy plot. More's version of the character seems more of an establishment figure. He is unquestionably English and, he tells us early on, does some kind of work abroad for the British Government, although this angle is never developed or mentioned again. More had previously made several films with Ralph Thomas, including Clouded Yellow (1950) and Appointment with Venus (1951), as well as Doctor in the House. He had enjoyed great popularity in the 1950s, but his film career was about to go into decline in the 1960s. This was probably because his kind of characters, former officer types who had had "a good war" and took everything in their stride, were too indelibly associated with the previous decade, as was More's entire image. As seen in The 39 Steps, More, with his slightly clipped, well-spoken voice, flat cap and tweed sports jackets, wasn't the kind of leading man who would flourish in the era of "kitchen sink" realism and James Bond. Finnish actress Taina Elg is a little stiff as the school teacher Miss Fisher, probably not helped by the fact that English was not her first language. In what I take to be a joke, when we first see her character on the train Hannay boards to Scotland, she is reading the novel Anatomy of a Murder. Elg's casting was one of several attempts by the Rank Organisation to inject some continental glamour into their films in the 1950s, but she is unlikely to displace anyone's memories of Madeleine Carroll in the 1935 film. As the supposed romantic interest, she is colder than any Hitchcock blonde, and never visibly warms to Hannay as she is meant to. Unlike Madeleine Carroll and Robert Donat in the Hitchcock film, there's no real sexual undercurrent between her and Kenneth More, and the chemistry between the two leads is conspicuous by its absence. When More cajoles Elg and drags her along with him, he feels less like a potential lover, and more like an older brother exasperated by his annoying sister. One of the problems for the many remakes of The 39 Steps is that the story is relatively thin and poses more questions than it answers. Without the skill and bravado of Alfred Hitchcock, the implausibilities in the story become a little too obvious. This is a particular problem for the 1959 film, because it sticks so closely to the Hitchcock plot, but doesn't display any of Hitchcock's flair or imagination. The Hitchcock film is also thematically richer, and moves fast enough to skate over some of its improbabilities, whereas the 1959 film is more of a gentle canter. It also lacks the contemporary relevance of the Hitchcock film. Despite updating the MacGuffin to a ballistic missile programme, the story feels stuck in the 1930s, with no real contemporary relevance. This is quite unlike both the John Buchan novel, which was written in the middle of World War I, and the Hitchcock film, which was produced in the looming shadow of World War II. The 1959 version is sometimes referred to as a scene-for-scene remake of the Hitchcock film, something that's not that far from the truth. While the film's reliance on the plot and structure of the 1935 film is a creative shortcoming, it does make for an intriguing comparison with the Hitchcock version. The comparison demonstrates clearly Hitchcock's superior skill as a film maker, and allows the audience to see how much he gets away with in his version. Partly this is because the treatment in his film is stylised and expressionistic, rather than doggedly naturalistic as the 1959 film is. The Hitchcock film, with all its artificiality and studio filming, has a heightened sense of reality, something that allows the audience to be captivated and carried along with it, without stopping to ask too many questions, or even be very much bothered about the details of the plot or the story's improbabilities. According to Mark Glancy's book The 39 Steps, part of the British Film Guides series, Hitchcock had considered remaking The 39 Steps himself around this time. Angus MacPhail, co-writer of Hitchcock's 1956 film The Wrong Man, had suggested a remake as the logical follow-up to Hitch's new version of his 1934 film The Man Who Knew Too Much. Hitchcock was less enthusiastic about the idea, but was interested enough to check to see if the rights were available, only to discover that they belonged to the Rank Organisation. Coincidentally (or maybe not), the year the Kenneth More remake was released also saw the release of Hitchcock's North by Northwest, in which an innocent man is framed for murder and pursued across country by the police, spies and enemy agents, all while becoming involved with a beautiful blonde. Although Hitchcock didn't get to remake The 39 Steps, if he had remade the film in an American setting, perhaps it wouldn't have looked all that dissimilar to North by Northwest, a film which is at the very least its spiritual successor. After the 1935 Hitchcock film, the best screen version of The 39 Steps is the 1978 film starring Robert Powell. The Powell version, directed by Don Sharp, shifts the story back to the pre-WWI era, and draws more on John Buchan, making it more than simply another re-do of the Hitchcock film, although Hitch's influence is still apparent. The fourth screen version, the 2008 BBC television production, starring Rupert Penry-Jones as Hannay, tries to cram too many new twists into the story and ends up tripping over itself in the process. 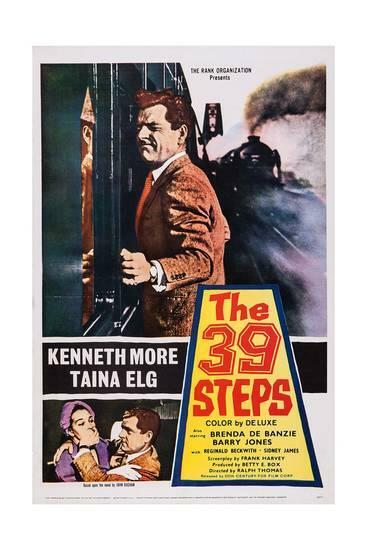 The 1959 version of The 39 Steps was successful at the British box office, but has always been regarded as inferior to the Hitchcock film. Even Ralph Thomas seems to have agreed with this, calling the film "a piece of effrontery that didn't come off". The film is a pleasant enough time-passer, but the director of Doctor in the House is not the obvious choice to follow in the footsteps of Alfred Hitchcock, and the film is more of a lightweight star vehicle for the likeable Kenneth More than an edge-of-the-seat thriller. And while it will likely please More's fans, and does contain a few incidental pleasures, it can't help but be a pale shadow of the Hitchcock original. I've never even heard about this remake, an unnecessary one it seems. I'll never understand directors who feel the need to remake perfect films. It can only fall flat. A few years ago we had the scene-for-scene remake of Psycho for no good reasons. I remember reading the Buchan novel a few years ago. Hitchcock vastly improved on it. The addition of a female character does make a big difference and no doubt made the film more saleable in 1935. At least Buchan had a reasonable explanation for his title though. The meaning of the title in the Hitchcock film is a bit lame. In the remake, the steps are actual ones that lead to the HQ of the spy ring, but that's really no better. Talking of unnecessary remakes, there's also a 1970s remake of The Lady Vanishes, made by Hammer, of all people. Some good actors in supporting roles, but unfortunately the leads are wildly miscast (Cybil Shepherd and Elliot Gould). No one is ever going to mistake Elliott Gould for Michael Redgrave! It's true about the title, but then for Hitchcock it was just a MacGuffin. And on top of that a MacGuffin so irrelevant that most people can't even remember what it was about. There was also a 70s remake of Double Indemnity. Truly awful. I think there was a phase of American TV doing remakes of popular films, probably because they had name recognition. I shudder to think of a TV version of Double Indemnity, or any other black & white film noir. The problem with the 1959 version is that it tries to mimic Hitchcock. They should have gone back to the book. I kinda liked the 1978 version, with Robert Powell as Hannay. I've read the book and this version stays pretty close (minus the ending) to John Buchan's story. It isn't perfect, but it is the best remake I've seen so far. Strangely enough, the credits for the 1959 film claim that it's based on the book, but it clearly isn't. I'd be surprised if the writer had even read the book, but there's no question he'd seen the Hitchcock film! I like the Powell version too. The ending still works surprisingly well, even if it is borrowed from a Will Hay film (!). Powell actually played the character again in the late 80s TV series "Hannay", which is showing on one of the classic channels here at the moment.